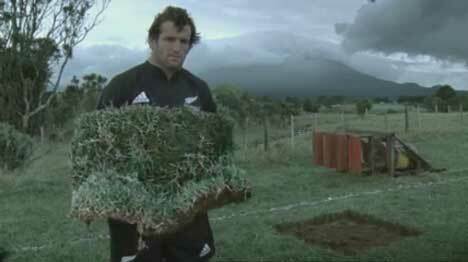 Adidas International has commissioned a stirring campaign to support the All Blacks run for the Rugby Union World Cup in France, using dirt and grass. The 30-man squad each carried a capsule of earth from every New Zealand rugby ground that was once trodden on by one of the 1071 men chosen to represent New Zealand in the country’s national game. We’re given a sample of the fields and settings from which All Blacks have come. Dan Carter kicks a ball on the mist-covered grounds of Southbridge in Canterbury. A rousing game of rugby is played on a Counties-Manukau ground – the club from which came seventeen All Blacks. We’re shown a patch in the Wellington stadium from which came 153 All Blacks. Waikato produced 55 All Blacks. Kurow in North Otago produced two All Blacks, Phil Gard and Charlie Saxton. Wairarapa Bush produced 29 All Blacks. Opunake in Taranaki produced 3 All Blacks, Carl Hayman, Graham Mourie and Bill Currey. Music ranges from the Scottish bagpipes through to a traditional Maori haka. 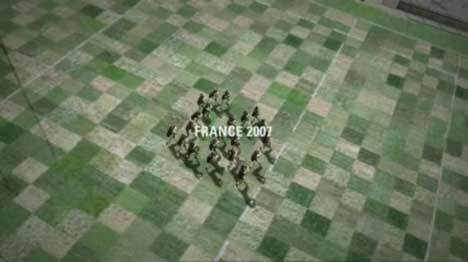 The Of This Earth campaign was developed at 180 Amsterdam by executive creative director Andy Fackrell, creative director Richard Bullock, art director Stuart Brown, copywriter Nick Marzano, agency producer Cedric Gairard and planning director Andy Edwards. Filming was shot by director Johnny Green via Knucklehead, London, with producer Bruce Williamson and director of photography Adam Kimmel. Editor was Filip Malasek via Robota, Czech Republic. Post production was done at Moving Pictures Company, London.